Normally with a man in the starring role, Bobbi, is turning 35, but Bobbi’s friends are still asking the same question in Stephen Sondheim’s 1970’s musical: why isn’t Bobbi married? On the face of it, it all seems a bit archaic almost 50 years on! But “the increasing difficulty of making emotional connections in an increasingly dehumanised society” (Sondheim’s words 48 years ago) IS still valid and so this musical, starring Pattie Lupone, Rosalie Craig and Mel Giedroyc, is definatly worth a trip down to London. 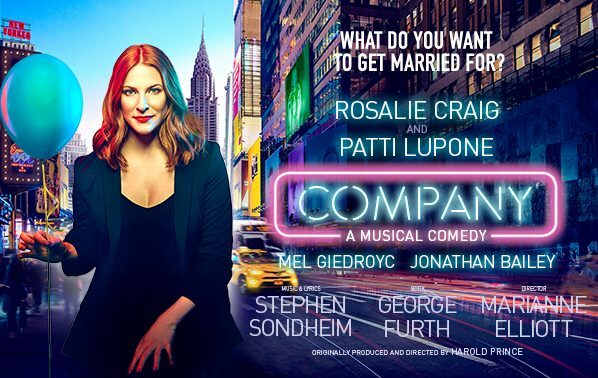 Playing at the Gielgud Theatre on London’s Shaftesbury Avenue until March 2019, Company Theatre Breaks are available for a strictly limited time. Nearby Hotels include the Thistle Piccadilly and Trafalgar Square Hotels, The St Giles and The Cavendish. And The Savoy is only a short stroll through China Town and Covent Garden!